Acme RD-208TRe4 DP LGA2011-3 socket R3 server, 2U rackmount, Black Color. This is a 2U machine with dual powerful Xeon E5-2600 v3/v4 processor, DDR4 high speed memory, 8 hot-swap HDD, 4 full height slots. Good for Database, VM machine or almost any applications. 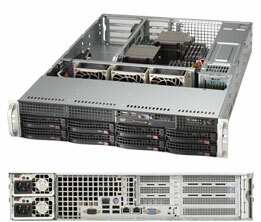 best fit: web server, email server, storage server, VM applications. supports 2 of E5-2600 v3/v4 processors, up to 20 cores each. Supports up to 1TB of Registered DDR4 2133/2400MHz memory. Slots and Bus: full height. 4 PCI-e 3.0 x8 slots. Dual Gigabit Ethernet Intel i350, RJ45 ports. VGA - On-board graphics, AST2400. 2U case with Redundant 740W power supply (platinum level high efficiency). 8 of 3.5" HDD hot-swap bays ( w/ backplane). 2 HDD bay, 1 slim DVD bay. Width: 17.2 in. Height: 3.5 in. Depth: 25.5 in. * add heatsink per each CPU. ** can use external USB Floppy or DVD drives. *** can add a SAS or SATA RAID controller. **** Processor, Memory and hard disk drive are not included.